At a time when trailers spill an ever-increasing amount of spoilers in a competitive bid to draw audiences, Joy’s is refreshingly economic with the plot. Even reticent. We glean that it centres around a headstrong woman, her strained familial relations, and perhaps a dalliance with the business world. But precious little more. 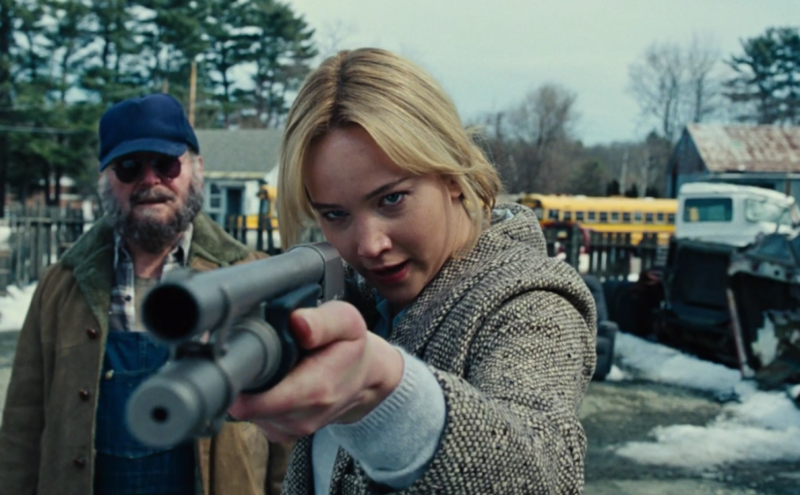 This movie is sold entirely, then, on the key personnel that bring it to us, namely Jennifer Lawrence, Bradley Cooper and writer-director David O. Russell. A reuniting of the team that delivered the huge hits Silver Linings Playbook (2012) and American Hustle (2013) carries enough weight to do so. Throw in additional players; the likes of Robert De Niro and Isabella Rossellini, and the deal is sealed. The production company presumably decided that revealing it’s a biopic of the ‘miracle mop’ inventor would be a tough sell. Unlike, in the end, her mops. Shrewdly vague in crediting its source material, the nearest the film gets to specifying its real-life origin is the opening message “Inspired by the true stories of daring women. One in particular.” While certainly an interpretation of the perilous journey to eventual success of Joy Mangano, surrounding marketing hesitantly points out that it is semi-biographical. What is fact and what is fiction remains unclear. We glimpse Joy’s childhood; her frolicking in the snow with her half-sister, channelling her fledgling creativity into making paper cut-out toys, and being emphatically informed by her grandmother that she will achieve great things in life. All too soon, Joy is looking back on the lost idyll of her youth from the viewpoint of motherhood, a failed marriage, and her own divorced parents, who cannot even address each other without descending into ornament smashing incivility. By this time, Joy is the central supporting joist of this particularly dysfunctional family. Not only her child, but her ex-husband, her psychologically bedridden mother and her cantankerous dad all depend on her capability to get each of them through the day. Thus her capricious home life is endlessly testing. You wonder how she has not caved under the pressure already. In the telling, watching the tale unfold with no knowledge of its core premise is hugely to its advantage. The path of the plot feels as unpredictable as the domestic melange Joy is constantly trying to manage. Driven by desperation, her inspiration for a more user-friendly floor cleaner is an incisive culmination of her childhood creativity and her adult practicality. It’s an idea she knows in her bones has potential to, ahem, ‘clean up’. If only she could find a way to bring it to market. Lawrence’s steely performance anchors a chaotically vibrant family drama with a bullish determination. Naturally, she wipes the floor with those who dare to cross her. Bradley Cooper shines, playing off her corporate naivety as the polished TV exec with just enough of a chink in his emotional armour to let Joy through. The newly dating De Niro and Rosselini add a fine splash of colour; him with the bulldozing tactlessness of a rueful divorcee demanding romance in his ‘third age’, her with a hardened but tacky continental glamour. Meanwhile, her mother (a fraught Virginia Madsen) is terminally plugged into the gaudy soap opera that contextualises the actual melodrama playing out before us. Subtly amplifying the sense of reality, it imbues the picture with the slightest touch of magical realism that raises Joy’s story out of the humdrum and into the mythic. And so, that wise reticence of the trailer pays enormous dividends. So much so, a lack of foreknowledge feels fundamental to this film’s success. Follow your heart despite seemingly insurmountable odds is the picture’s joyful message. It’s hardly the most original Hollywood moral. Yet something in the telling, something in the proof that an object literally as dull as dishwater has the potential to be entirely transformative elevates Joy to something approaching a real-life fairy tale.